Beautifully folded towels always cause a storm of positive emotions and exclamations in others. Folding it takes very little time. There are several ways to obtain this Terry products. 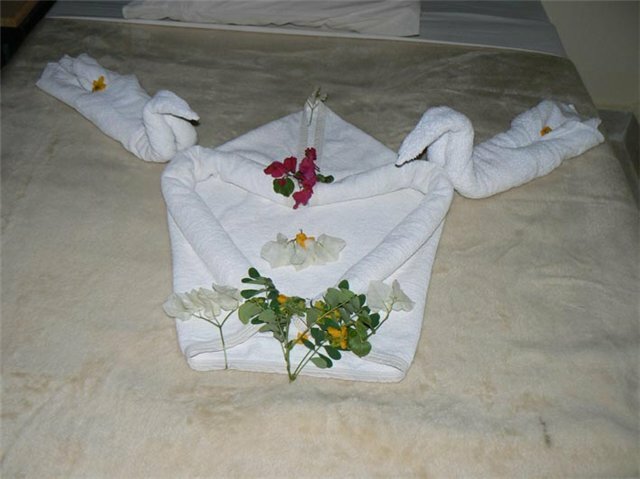 The simplest thing you can make out of towels, so this Swan. 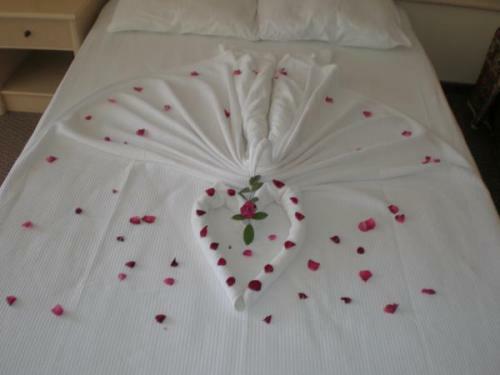 To do this, lay a towel in front and two top edge fold in the middle to make a triangle. Twist the outer edges to the center. The top point of this triangle will be the head of a Swan, and hide his tail under the other towel, which should be spread by the waves in a circle. A composition you can decorate a variety of decorative leaves and flowers. At the sight of such "Terry statue your guests will be impressed. 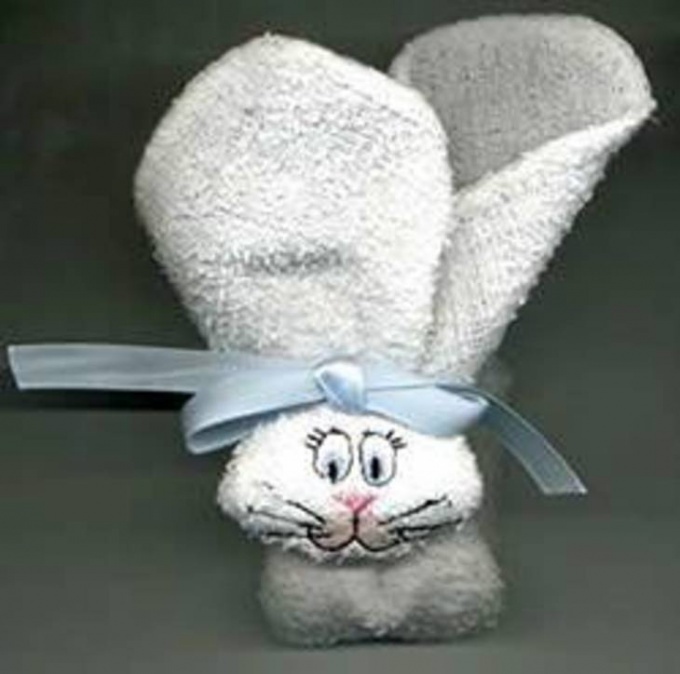 Square towel can be folded into the shape of a hare. Take the pre-prepared towel, and twist it into a tight bundle. Next, fold it in half and fold the one edge. Ribbon tie it at the base. Thus you get the head and ears of a hare. Attach the eyes. They can use a variety of decorative buttons and Velcro. You can also fold the rabbit in another way. Twist towel in double harness. Then fold one end and tie the same ribbon as in the previous method. Tie the rabbit cute bow and attach the eyes. Face can be embroidered with colored thread. A figure can be done as a gift for their loved ones. 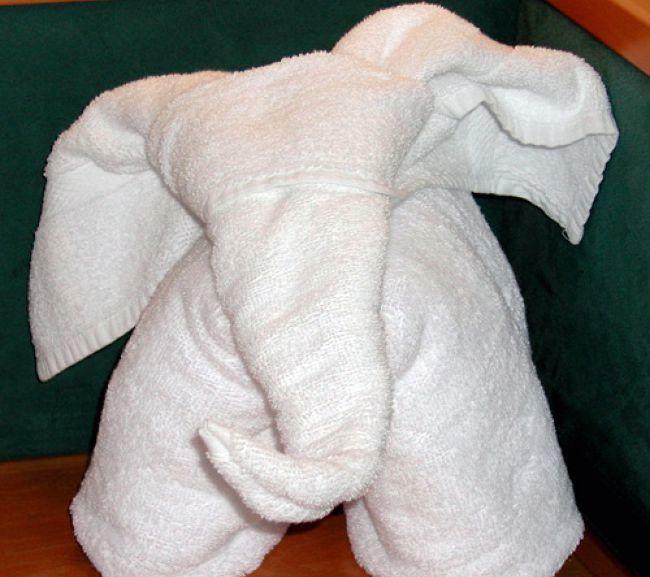 You can also fold and elephant. On a flat surface roll out the towel and fold the edges on top and bottom, pre-measured out from them 15 centimeters. Then again wrap the edges to the same length. Start to twist the towel on the left, gradually moving to the middle, then turn exactly the same "roll" on the right. Holding the towel smooth side up, fold in half. You got the legs and the body of the elephant. Now, put them aside and grab another towel. Lay it horizontally with the long side, the top towels in the middle of something to press it at the wrong time did not move. Roll the towel tube on both sides so that his appearance was similar to the airplane, which we all used to do out of paper. "Tube" should be as tight as you can. Tighten the edge to the center as long as possible. The towel with the flat side turn up. Wrap the lower edge so that the side pieces were like the ears. Pointy part, retract, and bend a bit so it resembled a trunk. And the last one. Earlier the body will set the head of your elephant. That's all, the elephant is ready. You can also to decorate it with eyes, bows, etc. Positive emotions and the cheers of others is what is called a nicely folded the towel. Folding of such figures requires very little time. There are a variety of ways. To get started, buy high quality Terry towels. You can then proceed to the most simple shape of a Swan. Put the product in front of you, then turn it so that the top two edges were in the middle and make a triangle. How beautifully folded napkins. Interestingly it turns out - whatever book on etiquette you take, will not find anywhere else how to lick a plate. Napkin - an indispensable attribute of the table. Rule 4: In polite society at the table is not made to do sharp sweeping movements. Should not to aggressively shake the cloth to expand it. Do not wipe with a cloth, like this towel for morning exercise. Just lightly blot your mouth.